Pure Aloe Vera products is very difficult for a consumer to distinguish from others, and there is much confusion about the quality of these products and how effective they are. Officially there are no laws governing the quality of the Aloe Vera products, except compulsory indication of Aloe Vera to the list of ingredients on the labels. Similarly, the term "organic" is not governed by laws. Very often the word "organic" is used to describe products that actually are very little, or almost "organic". Why some Aloe Vera products actually are not as effective? Aloe Vera is soluble in water, and there are many ways to be diluted with other liquids. There are some companies that do this, although they refer to the percentage of Aloe Vera their products contain. And there are other companies that also do this, but they do not refer to the percentage. It may well be a product has 10% -15% Aloe Vera and the rest be only water and sweeteners (taking advantage that the pure Aloe Vera juice is bitter) and sell it as Aloe Vera juice. While in fact it is a solution of water with some little quantity of Aloe. However not all diluted Aloe Vera products are so easy to discern. Often required sophisticated laboratory tests to be sure, something that obviously we consumers do not have access. High temperature is used during processing. This "kills" the bioactive ingredients of Aloe Vera, causing it to lose its effectiveness. The Aloe Vera plants have not grown organically, and there may be residues of pesticides and herbicides, that can even cause allergic reactions in some people. There is a long period of time between harvesting and processing. The Aloe Vera leaves may begin to decompose, and sometimes the chemicals to be used to prevent further decomposition degrade the quality. Harvesting of immature Aloe Vera plants. The plants should be at least three to four years to be mature and to have the highest abundance of nutrients. Younger - immature plants have not yet been developed. Harvesting of younger - immature plants harms the development of these same plants. Read more about the cultivation, harvesting process and stabilizing proccess at Stabilized Aloe Vera of Forever Living Products. 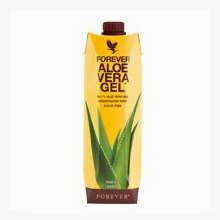 Aloe Vera products that are certified by IASC, International Aloe Science Council, containing guaranteed pure Aloe Vera. IASC was established in the early 1980's and has developed a high quality process for the certification of Aloe Vera products. All companies that manufacture Aloe Vera products and producers who grow Aloe Vera plants must first be certified by the IASC. Tests and checks are taking place on the Aloe Vera plants that are used, on the composition of the finished product and the ingredients listed, to make sure that they agree with what the manufacturer or the company says. If all agree with the specifications of the IASC, companies acquire the IASC seal of certification. There are hundreds of Aloe Vera products that have received the IASC Certification Seal, such as skin care products, soaps, lotions, gels, personal care products, and of course Aloe Vera plants, Aloe Vera juices and more. Annual re-certification of their raw materials. Annual recertification of their finished products. (Analytical testing in independent laboratories). Inspection and recertification of treatment facilities every three years. 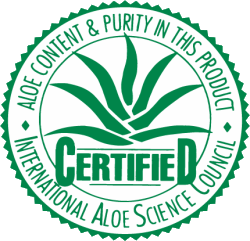 Each Aloe Vera product that has received the IASC seal of certification is containing guaranteed the highest quality of pure Aloe Vera that meets the IASC standards, the labeling of the product is correct and the Aloe Vera content reported is true. Forever Living Products is proud of his own pure Aloe Vera juice - Aloe Vera Gel, which is the first ever product that has received certification seal from the IASC back then! And today a large number of products of Forever Living completes its list of approved products.